One of the buzzwords nowadays is ‘viral’. What is it and how can you use it? 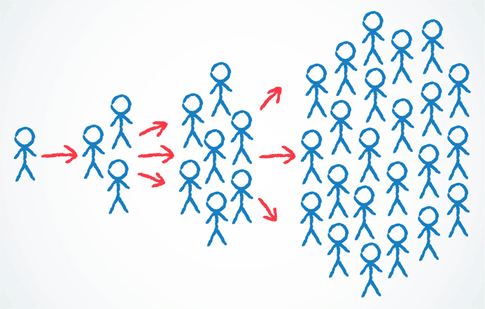 ‘Viral’ is used when information spreads by itself through the vast interconnected network of social media that are available today like Facebook, Twitter, YouTube, Pinterest, chat clients, etc. Just like with a virus, the spread of ‘infected’ people increases exponentially. The new album ‘Yeezus’ of Kanye West that (supposedly) was leaked. The song ‘Gangnam style‘ by artist Psy (and with it his career). You probably can recall a few yourself. You maybe even composed a ‘Harlem shake’ video of your own or with your colleagues at work (if so, please share in the comments). Further, your content doesn’t need to be inaudio or video format, other things can go viral too. Sometimes these things are specific and tangible (eg. the ‘Harlem shake’ video and ‘Gangnam style’ song). However concepts like ‘planking‘ or physical items like the iPhone can also go viral. How does something go viral? To compare with a disease: to go viral you need people who carry and spread. And spreading these days is not that hard anymore because of our increased interconnectivity. The people who spread are your promoters. It can be compared with your friend praising the new coffee shop in your town, but with our social media they are now saying it to (on average) 140 other people at once. These 140 other people have in average another 140 connected people and if they share and if their contacts share… Well, do the math. On the other hand, it’s not enough that some random people start to spread. A lot of my Facebook friends are spreading stuff, but I would rarely open it. It depends who is spreading it (“wow, if he is promoting this, I must see it”), or the number of people that are spreading it (“wow, there must be something going on”). For example, a new rock song parody that your aunt promotes, or that the Artic Monkeys do. Or that thirty of your friends do. To summarize: viral content is pushed by people and driven by the influence of those people, and the popularity (number of shares). Can you choose to go viral? This is probably the million dollar question every marketing company is looking for the answer to. People nowadays are already overwhelmed by communication from all kinds of sources: the Internet, books, blogs, social media updates, etc. Why would they choose to watch or even find your content? You need to get your promoters working and start sharing your content. But before you start, remember: content is king. What is so special about your content that people are willing to take a (small but real) reputation risk by spreading it? To go viral your content also needs to be picked up by the great mass, and you cannot control that. How can you use viral at work? As a change & culture officer, we sometimes like to spread things the viral way. Setting up a community of change ambassadors. Spreading bits of information that everyone is eager for. To refer to the old saying “knowledge is power”. Leaking news/updates to specific groups of people. Leaking alleged ‘hidden’ or ‘secret’ content, and new insights. Starting up an in-company competition. Blogs that publicly appraise others.